First Paragraph(s): I needed two minutes. Just enough time to get to the maildrop and back, but I had to time it perfectly. Dying wasn’t an option today, just like it hadn’t been an option the last ten times I’d done this. I’d thought it would get easier after the first time. It hadn’t. I gritted my teeth and scanned the holoscreen again. The mail was due to arrive in less than a minute, and although the forest above me looked harmless, I knew better. The shadows between the trees were too silent, too watchful. I hit the refresh button. The drill was simple—refresh the screen, scan for a full minute, refresh again and scan the opposite direction. I imagined it was similar to what parents used to teach their kids about crossing the street, back when there were still streets to cross and cars to drive on them. Esteemed Reader, there is nothing quite so enjoyable as a middle grade action novel that's taut and exciting with characters you can care about and root for. Many have tried and failed, but Laura Martin succeeds on every level. 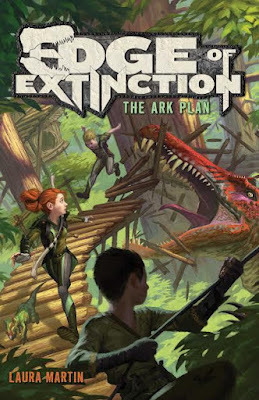 In fact, I'll give Edge of Extinction - The Ark Plan the highest compliment I have to give: I wish I had written it. Plucky middle grade characters with a handful of futuristic gadgets traveling across a post apocalyptic Indiana inhabited by dinosaurs in a story containing subtle Biblical overtones? Dude, I should've been all over that, but now I can't because Laura Martin got there first. Also, there's a decent chance yours truly might get thanked in the back of a third volume just as Laura will be thanked in the back of Banneker Bones 2 (coming soon-ish). Laura wrote a guest post for us last year and anytime an author does that, I at least browse their book. Edge of Extinction - The Ark Plan sucked me in at once and I knew I wanted to meet Laura because I respected her work and our brains clearly run on a similar track creatively (she also likes stories about fun conspiracy theories). Turns out she's a fellow Hoosier and a short drive from my house, and yadda, yadda, yadda, she's now a member of my beloved writing group, the YA Cannibals. Okay, full disclosures out of the way, let's talk about this book. I imagine if I made a pie chart of all the elements of books I've discussed in these reviews over the years, the largest wedge by far would go to my admiration for a great opening. In my mind, chapter one is the most important in the book as it either hooks me and interests me in the story or it doesn't and I imagine it to be the same for my readers. I've read great books with lousy openings I was glad I stuck with, but more often, a lousy opening promises more of the same, and if I'm still struggling to care about what I'm reading two chapters in and I haven't promised to review the book here, I'm usually looking for a new book. I imagine younger readers to be even more impatient. We're about to meet eleven-soon-to-be-twelve-year-old Sky Mudy, her best friend Shawn Reilly, and later, my personal favorite character, the nearly feral Todd. We're going to learn their backstories, the rules that govern their world, and their motivations for the adventures they're about to have. In chapter two we'll learn Sky has gray eyes and curly red hair (that's how you know she's a middle grade character). But we don't care about that in chapter one. Turning on my heel, I sprinted for the compound entrance. I spotted the disturbance to my left when I was still fifty yards from safety. The ground began to tremble under my feet, and I willed myself not to panic. Panicking could happen later, when I was safely underground with two feet of concrete above my head. I spotted the first one out of the corner of my eye as it burst from the trees. Bloodred scales winked in the dawn light as its opaque eyes focused on me. It was just over ten feet and moved with the quick, sharp movements of a striking snake. One of the deinonychus’s nails screeched across the metal hatch that separated their world from mine, forcing me to clap my hands over my ears. The creatures were still scrabbling and roaring, furious at their lost meal. And I wished, for the millionth time, that I could feed them the idiot scientists who had brought them out of extinction in the first place. Although being ripped to pieces might be too kind for the people who had almost wiped out the entire human race. “Similarities?” I asked, swallowing hard. I’d just finished reading the novel the night before, so I knew the answer, but I hated speaking in public. Facing the herd of deinonychus again would have been preferable. I wasn’t sure what that said about me. Sure enough, on Sky's twelfth birthday, a secret message is discovered in the compass her father gave her before he left. Yadda, yadda, yadda, he's still alive, she needs to find him, Shawn's coming with her, and the story is off and running... from dinosaurs. Turns out that a life spent underground has not equipped Sky and Shawn for the world above and after a few close calls with a T-Rex and other not-so-friendly dinos, they meet Todd, a surface-dwelling boy whose proficient at navigating among the beasts and even has his own pet dinosaur. I smiled. I thought that I might like Todd. He had a spark to him, as though he was so full of life that it slipped out of his pores. I wondered if I’d be like that too, if I’d been raised in the sunlight and fresh air. The creature was gaining on me. Teeth snapped together only inches from the back of my head, and I knew that this was how I would die. There was movement off to my right, and I realized that the dinosaur might be part of a pack. I prayed that it would be quick, that the creature would break my neck and not rip me to shreds while I was still alive. There's no graphic violence as this is a middle grade novel, but young readers will be thrilled to discover that's not the same as no violence. There' good times to be had throughout:) I know you'll love this book as much as I did, Esteemed Reader. I can't go into a great deal more detail without spoiling things that shouldn't be spoiled, so I'll share a tidbit I learned from this book because I've been chatting with its author. While critiquing one of Laura's future novels that I've read and you can't because my life is awesome and involves awesome things, I suggested she not use forms of speech attribution other than 'said' as well as cut down on the adverbs accompanying them. This is sage advice I learned from Elmore Leonard and countless other writers and have tried to employ in my own work. Back in my day, this was surefire advice passed from many a writing instructor onto me like a sacred law never to be broken, but the Ninja is getting older and the world is moving on, as it does. Laura asked me why I hadn't complained about employment of adverbs such as 'she huffed,' 'she breathed,' 'she complained warily,' and so on in this book. I admitted that I noticed their usage, but I rarely offer critique notes on a book that's already on shelves as they're of little use by then. Turns out Laura was encouraged by those in the know to use varying forms of speech attribution. An editor had even marked uses of 'said' and requested they be livened up. Another critique partner told me her daughter's class had held a funeral for the word 'said' and they were all being encouraged to use more creative words in their writing. It's a brave new world, Esteemed Reader, and I'm not sure how I feel about it. As for me, I like 'said' as I still feel its nearly invisible on the page, but I'm become less rigid about it. I share this detail with you in the hopes of improving your own writing. “I won’t.” I huffed into my still-wet bangs in exasperation, wishing that I’d chosen a best friend who wasn’t so nosy. He had the greasy, unwashed appearance of a kid whose parents didn’t keep track of how often he bathed, and a hollow look that I’d seen in the mirror a bit too often. “You compound moles don’t have much of a sense of humor, do you?” Todd said. “I did mention Sky was incredibly stubborn. Right?” Shawn asked, a crooked grin on his face. I was snapped from my musings by the staircase Ivan was climbing. It seemed to disappear into the floor, and I stared at it in confusion. Yes, such a grand adventure survival story, have to look for Code Name Flood when it releases.